Have you ever wanted to start a hobby that involves fire, sparks and an endless potential for the application of your creativity? Or do you want to dip your toes into what you might well like to pursue as an extremely fulfilling and rewarding career? 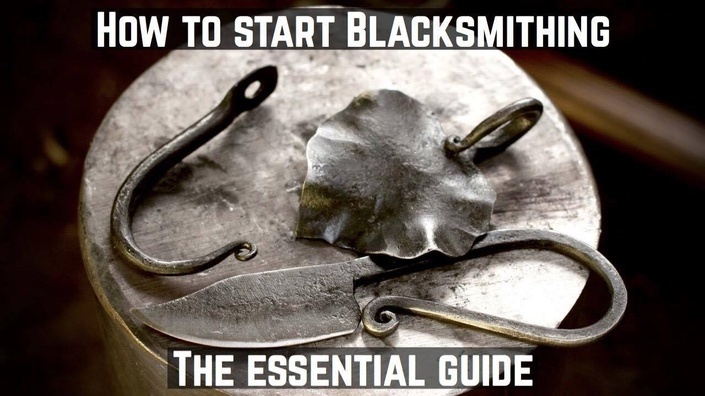 Either way, this course, made up of over 90 minutes of HD video and several easy to read ebooks, will introduce you to the craft of blacksmithing without having to sift through all the confusions, contradictions and chaos about the subject on the internet or in a book. From the comfort of whatever internet reading device you chose, you can stream this exclusive content, much like a youtube video, and learn how to start blacksmithing with under $90 in tools, most of which you probably already own. Once you have followed the guide to making and setting up your anvil and forge, follow along to the subsequent tutorials to learn how to make the following projects for the immediate gratification of being able to say "I MADE THIS" as you give a gift unlike any other to your loved one, or as you sell your wares locally. A small forged neck knife, showing also the heat treatment process. An elegant wall hook for hanging coats, keys and tools. A naturally inspired leaf form that can be applied as a key fob and pendant. Hand tools such as the Square, Round and Slot Punch. A beautiful leaf topped wall hook, combining all the techniques into one. This online course is the first of it's kind and is the beginning of a series of educational online products to be created by Alec Steele. Future courses will guide you through intermediate blacksmithing, all the way to making all of your own tools! "Join the worldwide tradition of men and women working hot iron by starting your journey today!" Why Should I Buy an Online Course? Save dozens of hours of time, sifting through the depths of the internet trying to work out how to get started by following this curriculum, created by someone well aware of the struggles associated with trying to start a hobby with limited resources! Benefit from being able to advance at your own pace! You can log back in and re-watch the courses for as long as you like, forever! Do it all in your backyard! No need to fly half way around the world to learn from a great teacher, do it all from the comfort of your garden. For what age range is blacksmithing suitable? For all age ranges from 11 to 111!! Blacksmithing is not as physically demanding as you think and it is the perfect hobby for creative individuals, no matter their age!